(Newser) – US officials say three US Army special operations commandos were killed Wednesday and two others were wounded when they came under fire in southwest Niger. 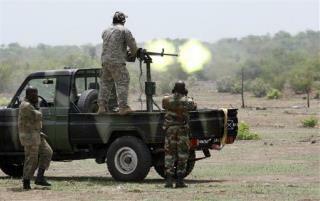 The officials say the two wounded were taken to Niamey, the capital, and are in stable condition, the AP reports. The officials say the commandos, who were Green Berets, were likely attacked by al-Qaeda in the Islamic Maghreb militants. In a statement, US Africa Command said the American forces were on a joint patrol with Nigerien Armed Forces troops north of Niamey, near the Mali border, when they came under hostile fire. Does anybody else need more proof , that Islam is a cancer to the world? Why are we in Niger? Can't any country in the world train its own troops?? If they can't, let the call the UN.